File: Women dance on the day of Teej in Pashupati area. 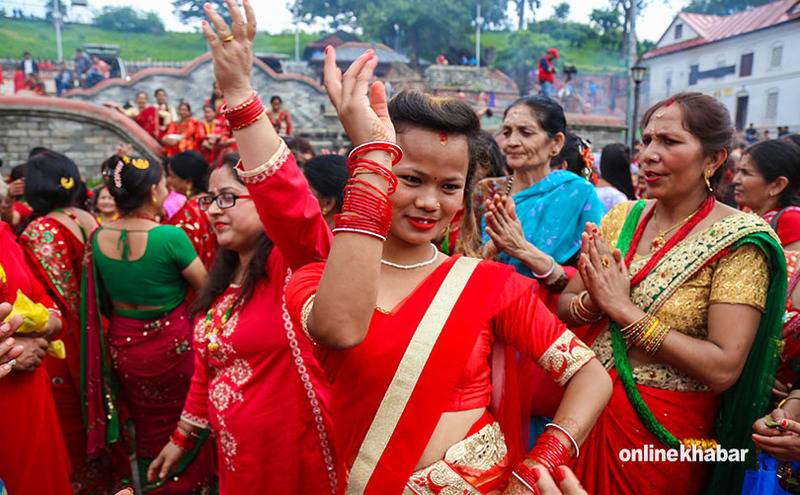 The Teej festival, also called Haritalika, is being observed by Nepali women, Hindus in particular, throughout the country on Wednesday. Women fast and wish for a prosperous life of their spouses on this festival, which falls on the third day of the waxing moon in the lunar month of Bhadra. Women rejoice with various delicious dishes known as ‘dar’ a day before Teej and fast on the next day as per the tradition. Women on this day take ritual baths in the morning and offer worships in the afternoon and evening. They pay homage to Lord Shiva, light lamps and spend the night awake. The festivity comes to an end on the fifth day of fortnight after worshiping the legendary ‘Saptarshi’ (seven sages). This unique festival of Nepali women is also a celebration of sisterhood as sisters gather at parents’ houses and indulge in jubilant dancing and singing. The legend has it that Parvati, the daughter of Himalaya, was on her maiden fast, wishing for the health and the well being of her spouse, Lord Shiva. Since then, the same day has been recognised as the Haritalika Teej. Married women put on bangles, pote (a necklace made of glass beads), jewellery and sindur (crimson powder), considered the symbols of good luck, and dress themselves up in red saris or other red outfits and adorn themselves with different kinds of ornaments. Both married and unmarried women perform various pujas and observe fasting, praying for fulfillment of their wish for a happy and prosperous conjugal life. The Pashupatinath Temple in the capital sees overwhelming number of women devotees this day.